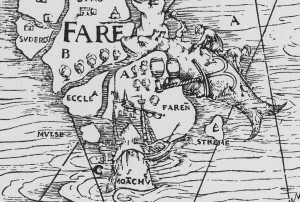 In the early months of 1568, Bremen merchant Gerdt Hemeling (the brother of the deceased Cordt Hemeling, about whose death we wrote in an earlier blogpost) complained to king Frederick II of Denmark about the theft of his ship in Shetland by a “Scottish man”. 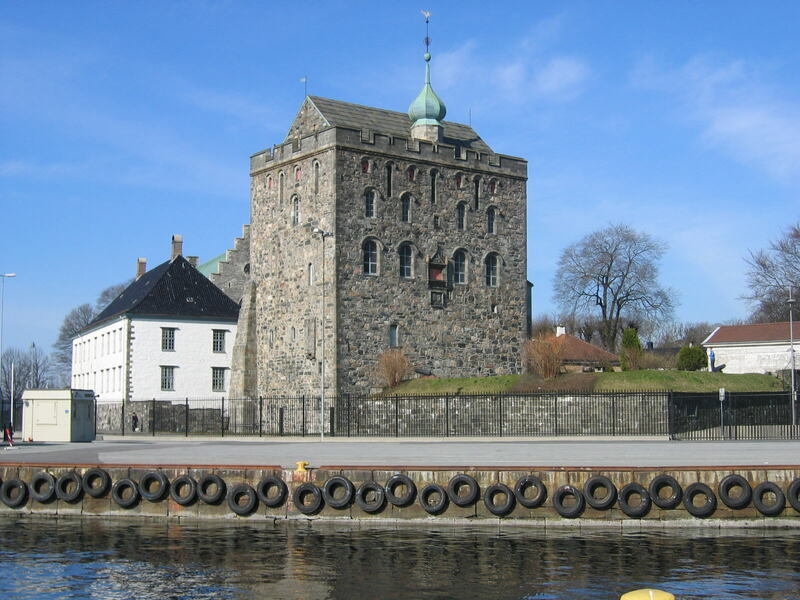 This man had promised to return his ship, or to compensate him for it, but was taken captive by Danish officials and was now in prison in the castle of Bergenhus in Bergen, Norway. 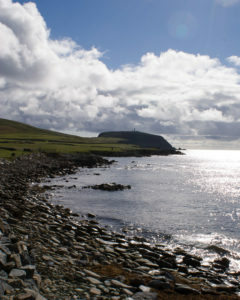 Now Hemeling, a “poor and extremely desperate man”, appealed to the Danish king to compensate him for the loss of his ship and his goods, which had been thrown overboard when the ship was taken, and most of which he had to leave on the shores of Shetland. Gerdt Hemeling had traded peacefully for years between Bremen and Shetland, staying on the islands every summer to trade commodities from mainland Europe for fish. 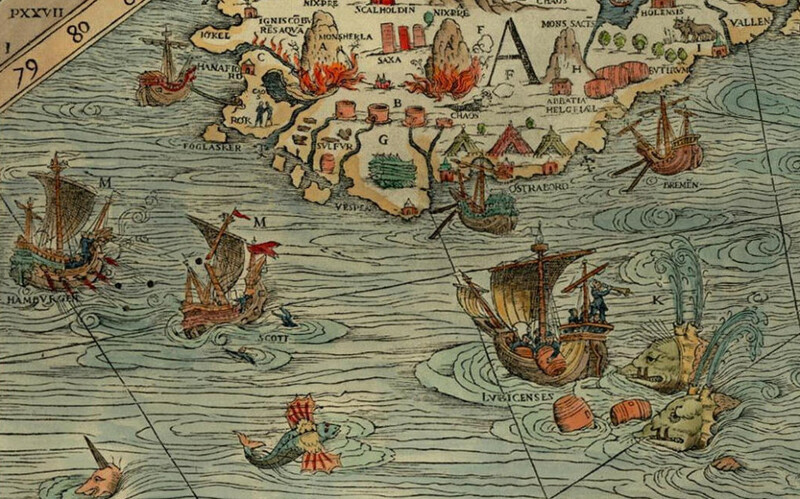 In the summer of 1567, however, this happened to be just the wrong time and place. While he was loading his ship the Pellicaen with fish in the harbour of “Ness in Schweineburgkhaupt” (probably Dunrossness near Sumburgh head, the southern tip of Shetland Mainland), a ship appeared from Scotland with a few hundred men on board, who offered Hemeling to buy his ship or to rent it for two months. Hemeling claimed to have had no choice but to accept this offer. The men from Scotland threw all merchandise on the shore and left, never to be seen again. Gerdt Hemeling’s case was in itself not unique. 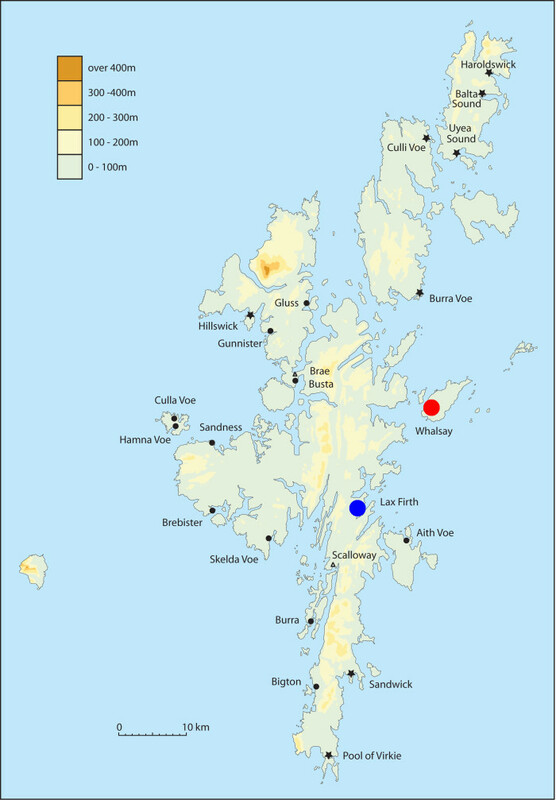 Piracy on German merchants on Shetland occured more often, especially in these years. 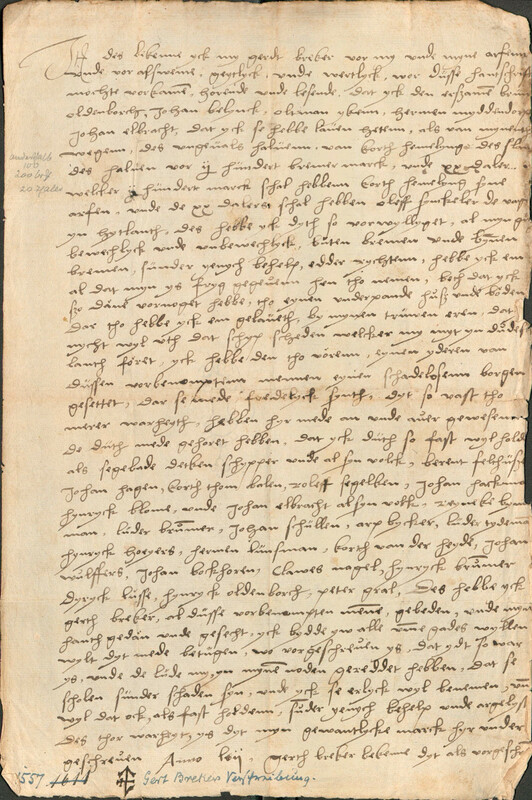 In the previous year (1566) the Shetland merchants from Bremen filed an official complaint to the city council in which they stated that at least six of them had become the victims of robbery. Scottish pirates had attacked their ships and trading booths and stolen their merchandise, money, weapons, and sailing instruments, to a calculated total damage of 1008 thaler. Two of the pirates’ captains, James Edmistoun and John Blacader, were arrested and executed the next year by the Scottish authorities. Gerdt Hemeling, however, found himself in a much more complicated situation. The “Scottish man” turned out to be none other than James Hepburn, 4th earl of Bothwell, an opportunistic nobleman who played a rather controversial role in high politics of his time. In 1567, when Hemeling accidentally met him, Bothwell was a man on the run. 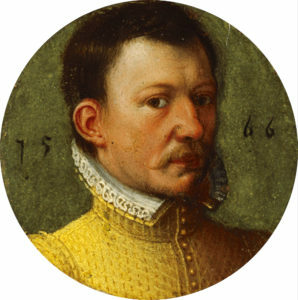 He was suspected of having murdered the second husband of Mary Stuart, Queen of Scots, of having kidnapped her (possibly with her own consent), and subsequently married her. Among the Scottish nobility, tensions with the catholic queen had risen in previous years, among others about religious matters, and Mary’s marriage to the protestant alleged murderer of her previous husband proved to be the limit. A coalition of nobles revolted, and faced Mary’s army in the battle of Carberry Hill. Mary eventually surrendered and was imprisoned, finally leading to her abdication, but Bothwell fled and tried to leave Scotland by ship to Shetland. Bergenhus castle, Bergen, Norway. 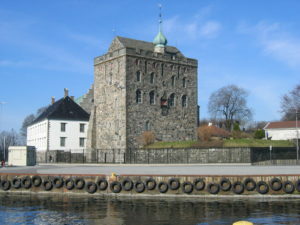 The so-called Rosenkrantz tower was constructed in the 1560s by Erik Rosenkrantz. Image: Wikimedia Commons. However, Bothwell was being followed by two Scottish lords who controlled the navy. In these chaotic circumstances, Bothwell lost one of his ships which struck an underwater rock, and desperately tried to acquire more ships for his fleet in Shetland. Luckily for him, every year there were a few German trading ships in Shetland, and thus he took Gerdt Hemeling’s ship and another one from Hamburg. However, he was not able to get rid of his persecutors, and a battle resulted in which the mast of one of the ships broke. 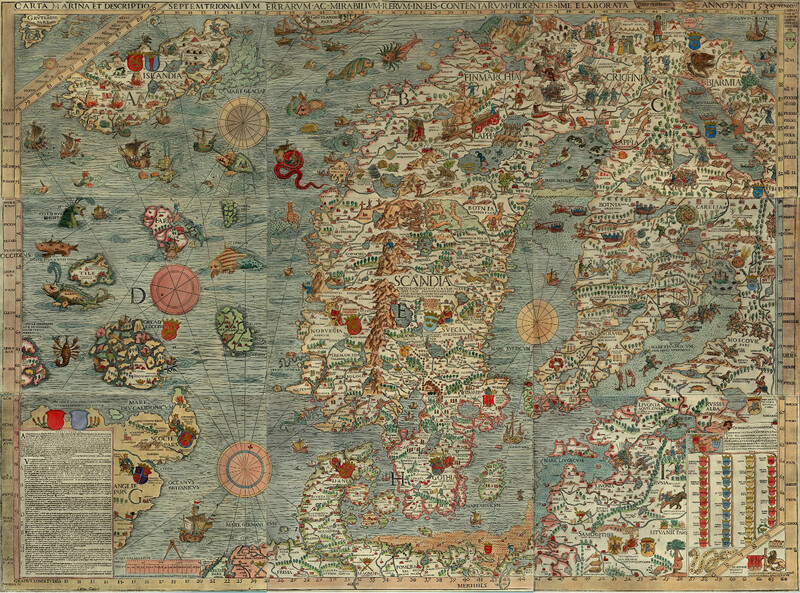 A storm subsequently forced Bothwell’s fleet to sail towards Norway, where he was first held for a pirate, taken captive, and locked up in Bergenhus castle by Erik Rosenkrantz, the governer of Bergenhus. When his true identity became known, Frederick II realised the potential of Bothwell in Danish captivity as a pawn when dealing with the English and Scottish crown, and had him transported to Denmark. Bothwell (who had been made duke of Orkney and Shetland by Queen Mary) promised to return these insular groups (which Christian I of Denmark and Norway had lost to Scotland in 1469 as a pawn for the dowry of his daughter to the Scottish king, which he had been unable to pay) to Denmark if the king helped him to free Mary. The Danish king never made use of this offer: Bothwell was locked up in Dragsholm castle, where he would eventually die in 1578. And did Hemeling ever get his ship back? Frederick II was unwilling to help Hemeling directly, but stated to him twice that he could press charges against Bothwell in Denmark if he wanted to. There are no sources pertaining to a case of Hemeling against Bothwell, so it is likely that Hemeling realised that a lawsuit in Denmark in such a complicated situation would not be worth the trouble, and he must have accepted his loss. On a morning in August, 1557, Cordt Hemeling was found dead in his bunk. He was the skipper of a Bremen merchant ship lying at Whalsay in Shetland. The previous evening, Cordt had complained that he was not feeling well and had gone to bed early. After having been found dead the next morning, fingers soon pointed in the direction of two of Cordt’s crew members, Alert Wilckens and the carpenter Gerdt Breker, who as a consequence were accused of manslaughter. Alert and Gerdt, fearing persecution, abandoned ship and fled onto the island where they hid in the wilderness to escape from Cordt’s brother Gerdt Hemeling and the other crew members. As the vegetation on the islands is neither tasty nor very fit for human consumption they were soon starving. Alert was the first to give up, offerring to pay money as compensation and returned to the ship, by which all guilt was transferred to Gerdt Breker. Breker, in fear, tried to keep himself alive by eating the buds of shrubs, but starvation and the threat of being abandoned on the island and of losing his house in Bremen finally drove him back to the ship. He agreed to sign a confession of guilt, and promised to compensate Cordt Hemeling’s family, mortgaging his house. 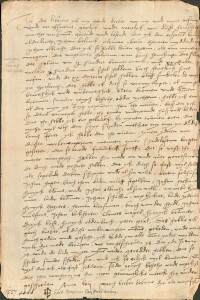 Gerdt Breker’s confession of guilt (copy). Bremen, Staatsarchiv, 2-R.11.kk. We would not have known this story if Gerdt Breker had not tried to cancel the agreement upon return to Bremen, where he was expelled from the city. He started a law suit where he claimed to be not guilty of the death of Hemeling, and that he had been forced by his desperate situation to sign a confession against his will. The case and the resulting body of documents, which are still kept in the State Archives in Bremen, give us a unique insight into the life of the merchants and sailors during their stay on the islands, and the relations between them. Tatort Shetland: the exact location of the fight between Gerdt Breker and Cordt Hemeling is unclear. Gerdt Breker claims that he returned from Laxfirth (Laeßfoerde; blue) with a boat when it happened. 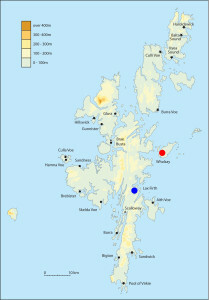 Olave Sinclair, the governor of Shetland, states that Hemeling’s ship was lying near Whalsay (red). 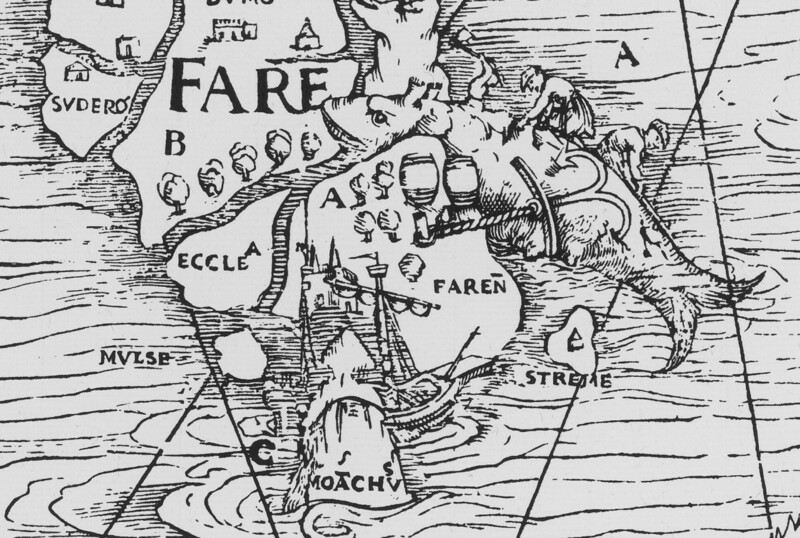 Both harbours are well-known hanseatic trading sites (map copyright M. Gardiner and N. Mehler). Cordt, however, seemed to be alright after the fight. Apart from complaining about his fingers, he acted normally for more than a week and took part in the normal activities, including a couple of visits to the shore to fetch sheep, until his sudden death. The exact cause of his death remained unclear. Although Gerdt Breker argued that the injured hand would hardly have led to Cordt’s death, it was the only more or less plausible explanation accepted. Therefore, the Bremen city council did not plea him free from guilt altogether. The council did show some clemency, however. Gerdt could return to the city and his house, and the amount of money he had to pay as compensation to the Hemeling family was lowered. We do not know what happened to Cordt Hemeling’s body, but it is likely that he was buried at a local church on one of the islands. 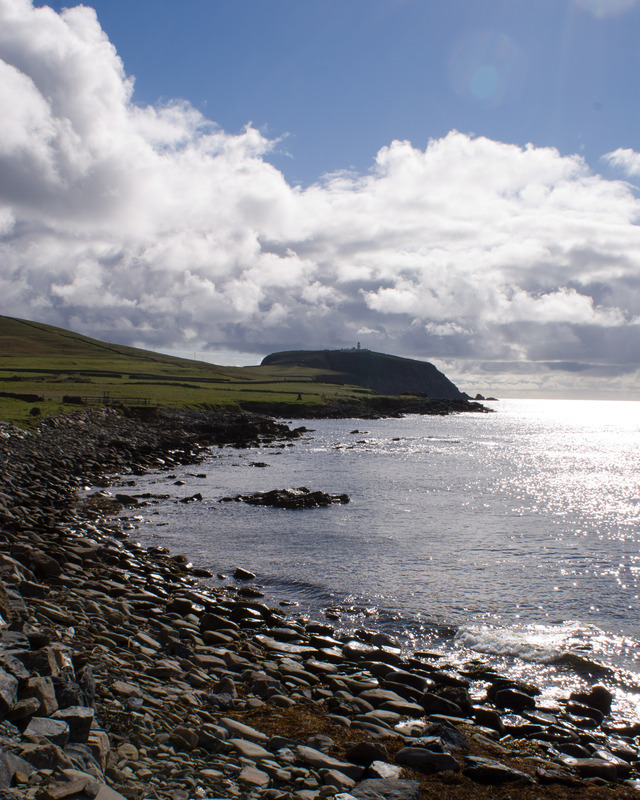 It is known that other German merchants were buried on Shetland, such as the skipper Segebade Detken, who was also around with a ship when this story happened, and is listed as one of the witnesses in Gerdt Breker’s confession of guilt.